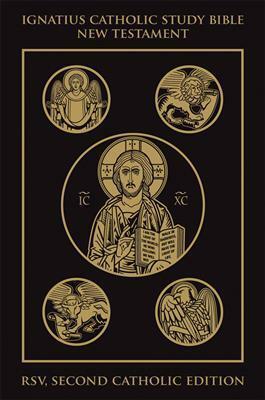 The only Catholic Study Bible based on the Revised Standard Version 2nd Catholic Edition, the Ignatius Catholic Study Bible New Testament brings together all of the books of the New Testament and the penetrating study tools developed by renowned Bible teachers Dr. Scott Hahn and Curtis Mitch. This volume presents the written Word of God in a highly readable, accurate translation, excellent for personal and group study. Extensive study notes, topical essays and word studies provide fresh and faithful insights informed by time-tested, authentically Catholic interpretations from the Fathers of the Church and other scholars. Commentaries include the best insights of ancient, medieval and modern scholarship, and follow the Church’s guidelines for biblical interpretation. Plus, each New Testament book is outlined and introduced with an essay covering questions of authorship, date of composition, intended audience and general themes. The Ignatius Study Bible also includes handy reference materials such as a doctrinal index, a concise concordance, a helpful cross-reference system, and various maps and charts. - Trim size - 7" x 10"
Curtis Mitch, a research fellow of the St. Paul Center for Biblical Theology, is the general editor of the complete Ignatius Study Bible series. These editions do not contain study questionsClick here to read more about the New Testament study bible and to download the study questions.